Natural disaster: Residents in Russia’s Far East fully understand the devastating impact of the floods now being experienced by people across Britain. 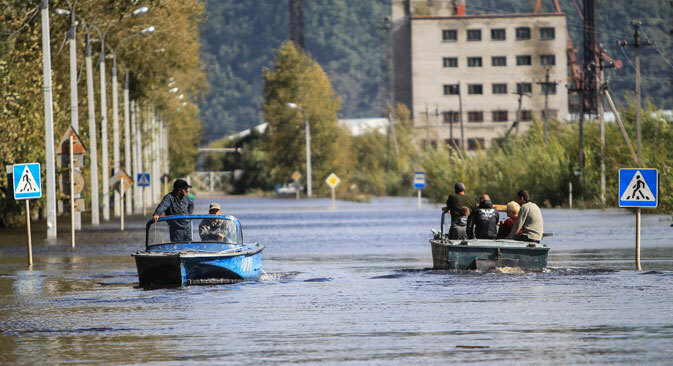 The current devastating floods in Britain are a reminder of what happened when the heaviest floods in 115 years hit Russia’s Far East six months ago. Between July and August, an area covering over 300,000 square miles – three times the size of the United Kingdom – was battered by tropical-force rain in the Khabarovsk and Amur regions. The rain fell on ground already saturated by the meltwater after an extremely snowy winter. This was the first time that all the major rivers in this vast area along the Russian-Chinese border became swollen at once. The main waterway, the Amur, rose by almost a foot every other day and reached a record 26½ft in Khabarovsk, the regional capital. This city of 600,000 people stands proudly on the high bank of the Amur, overlooking the Chinese lowlands, and its ornate Russian Orthodox churches on the cliffs can be seen from deep inside China. It was impossible to fathom that the Amur would be splashing at their porches but it nearly did. The historic high street, with its ornate red brick and art deco buildings and leisurely cafés, became a strand. The Russian blogosphere filled with images of flooded streets and houses. It was a lot worse in the fertile agricultural lowlands, the region’s breadbasket. More than 150,000 people in 235 towns and villages were affected, with damage to 13,000 homes across the Far East. Thousands of families had to be evacuated by the emergency services. Miraculously, or perhaps thanks to the timeliness and professionalism of the relief operation, not a single civilian life was lost. In neighbouring China, the floods claimed 100 lives. An impressive feat was achieved at Komsomolsk-on-Amur, a city of 250,000 inhabitants 221 miles north-east of Khabarovsk. Army units quickly built a two-mile, 20ft-high around an aircraft factory that produces Sukhoi fighter jets. This sea had also gobbled up the natural habitat of the region’s wildlife. Brown bears, cut off from their forage, had to be airlifted to save them from starvation – and the local people from their ravenous attention. The floods would have caused even more damage but for an extensive system of dams and reservoirs, built mostly in Soviet times. One of the dams was eventually breached, apparently due to negligence, which cost the presidential envoy in the region his job. His replacement, Deputy Prime Minister Yuri Trutnev promised a package worth £216m in aid to areas devastated by the floods. The immediate priority is to resettle the thousands of people who lost their homes. Anyone whose property was more than 75% damaged is entitled to a new house or a flat by September 30 this year. To top up the state aid, Russians donated funds worth £14m during a TV appeal. Just as some local councils in England were not averse to charging residents for sandbags, local authorities in Russia’s Far East were economical with their estimates of damage to property. An estimate just 1% short of the required 75% damage deprived residents of the right to a new home. This invited the wrath of Prime Minister Dmitry Medvedev who chastised officials for the “insulting” practice. President Putin apologised to those who had been decamped to barely comfortable army barracks and, in a strong show of support, chose to celebrate New Year in the region, in the company of residents displaced by the floods. One big difference with the UK was that the Russian floods were followed by a harsh winter, with temperatures dropping well below zero. About 1,000 houses froze into the ice, making it impossible to inspect and assess the damage until spring. The enormous damage to local agriculture is estimated at £1.2bn. The fertile plains were flooded with sewage and then frozen over. Farmers lost all their crops and cattle fodder. Some are desperately trying to collect hay from under the snow to save their dairies, afraid their cows will have to be put down. The government has promised emergency aid worth £15 million. More problems are anticipated when the snow and ice melts in a couple of months. Contaminated flood waters will pose health risks. The region, Mr Trutnev’s agency estimates, will need billions of roubles to build new drainage and flood defences. Now that the worst is over – at least until the spring – there is no shortage of claims and counterclaims about who’s to blame and what’s to be done. According to Yolanda Kakabadze, president of the World Wide Fund for Nature, the underlying causes of the massive flooding are deforestation and expanding farm land that encroaches on fragile wetland and water systems. This is a worldwide problem of a conflict between the drive for economic growth and the need to preserve ecosystems. The Russian Far East is acutely aware of this dichotomy, as Moscow has plans for massive development of the region. It will need £50bn worth of investment, according to Aleksandr Galushka, minister for Far East development, to attract people to live and work in this vast, underdeveloped area.